Israel’s Interior Minister Arye Deri has successfully wielded pressure in Acre to rid the seaside city of a recently erected memorial to the Palestinian author and playwright Ghassan Kanafani. Dery’s intervention came only a week after he and the prime minister foiled the appointment of the Palestinian-Arab Communist activist Raja Zaatry as deputy mayor of Haifa. The memorial to Kanafani was removed last week from Acre’s Muslim cemetery where it had recently been erected in honor of the man and works. Kanafani was born in Acre but left the city with his family for Lebanon during the 1948 Nakba. He became a writer and is still recognized as a journalist and playwright of international stature. Some of his works have been translated to Hebrew, including the well-known Return to Haifa, which was also adapted into a play at the Cameri theater in Tel Aviv. Like many from the Palestinian intelligentsia, Kanafani turned to activism and in the early 1960s, joined the Popular Front for the Liberation of Palestine, becoming its spokesman. On July 8, 1972 he was killed in Beirut, aged 36, along with his nephew Lamis Kanafani, 17, when his car was blown up by a bomb triggered by its ignition switch. The Popular Front accused Israel of carrying out the assassination. 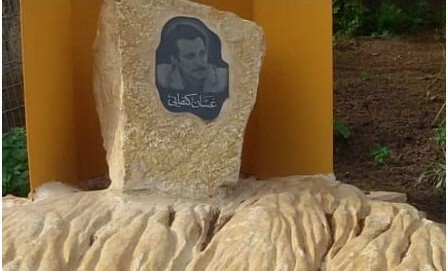 The memorial to honor Kanafani was recently erected by local activists in a corner of the Muslim cemetery in Acre. Soon after its erection, the Interior Ministry contacted the city’s Waqf (Muslim religious trust) committee, which is in charge of the Muslim cemetery, demanding that the memorial be removed immediately. Deri also tweeted the demand, adding that Kanafani had been “a member of the terrorist organization, Popular Front, which had carried out the attack on the Lod airport in the 1970s. There shall be no memorials to terrorists in Israel,” the interior minister wrote. Following a direct request from the religious affairs bureau of the Interior Ministry, the committee of Waqf trustees decided to remove the memorial rather than clash with the ministry over it. The religious affairs bureau had sent a clear message to the Waqf that failure to comply could result in punitive measures, including budgetary ones. Hadash Knesset member Aida Touma-Sliman of the Joint List and a resident of Acre herself, sent a complaint about Deri to Attorney General Avichai Mendelblit, claiming that the minister did not have the authority to make any such decision or to set the boundaries of freedom of expression based on his own worldview.